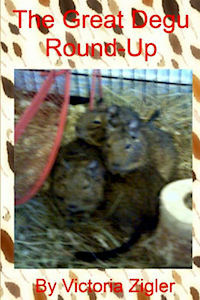 I’ve posted here on Kevin’s blog in the past about the writing of my Degu Days Duo. 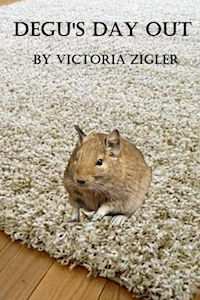 But – for the benefit of those who may not have seen that post – I’ll briefly recap by telling you that it’s a duology that is essentially a semi-fictionalized account of two different days in the lives of my own four degu boys: Jacob, Jasper, Jenks, and Joshua. Those two books are told from Jenks’ point of view, and my most recent degu book “How To Trust Your Human” – which is a semi-fictionalized account of my attempts at regaining one of their trusts after we lost the first three – is told from the point of view of my last remaining degu, Joshua, under the nickname of “Buddy” (to separate it from the duology it’s not officially part of). I call them “semi-fictionalized” accounts, because they’re based on real experiences, but since they’re told from the point of view of one of the degus, it’s difficult for me to be completely accurate about events, and they can’t really be considered non-fiction under those circumstances, can they? So, I list them as fiction, and advertise them as being semi-fictionalized. There’s a fourth book too. One that is entirely fictional, though it was one of my boys – Jasper this time – who was the inspiration for the story, after an escape attempt on his part when I didn’t double check the cage door, and accidentally left it open. 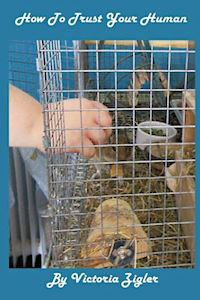 In this book, a degu named Oscar takes advantage of an unlocked cage door to escape his cage and explore the world outside of it without humans to supervise him and tell him where he can and can’t go. Working with James has been fun, and I’m pleased with his reading of all four of my degu books. If you buy the audiobooks, I hope you’re as pleased with them. You can also find the books listed on Goodreads. This entry was posted in books, creative writing, literature, newauthoronline, short stories, uncategorised and tagged animals, children's stories, fiction, k morris poet, newauthoronline, Now in audio the degu books, pets, tori zigler author, victoria zigler author, visual impairment on October 22, 2017 by K Morris Poet. I’ve had poor eyesight all my life, and eventually – in my early 20s – lost the last of my sight to the Glaucoma I was born with. So I’m no stranger to those times when people without vision problems were doing things I couldn’t be a part of. Not to mention, those times when tasks people with sight take for granted were difficult – or even impossible – for me to do with my poor, and later lack of, sight. Sometimes there really is no way for a blind person to do something a sighted person can do easily. But often there is. All it takes is a bit of creative thinking, a willingness to adapt the method used to do it, and maybe some special equipment or tools to make it possible. Take the screen reader Kevin and I use for our computers, for example. Without JAWS (Job Access With Speech) I couldn’t have written this post, and sent it to Kevin, and he couldn’t have put it on his blog for you to read. In fact, without JAWS – and the fact it makes it possible for us to use our computers in the way we do – there wouldn’t even be a blog for you to read, let alone a post from me to go up on it. Sure, there are still things we need help from a sighted friend or family member to do. But it opens up a world of possibilities for us that would never otherwise have existed. Without JAWS, the day I lost my sight would have been the day I lost my ability to access the internet. There are similar situations in other aspects of the life of a blind person. From simple things like pairing socks, to more complicated things like the above example using JAWS. It’s something that’s just a fact; it’s just the way things are. But there are – as I mentioned – often ways to make it possible for a blind person to do things for themselves, or to be included when they otherwise might not be able to be. I explore some of these situations, as well as some possible solutions for them, in my “Toby’s Tales” series. 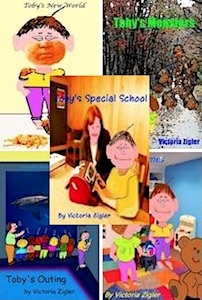 The Toby’s Tales series is a five book series that follows a little boy named Toby’s efforts to adjust after sight loss. I published the first book as an eBook in 2012, with the other four following quickly on its heals, and later made a paperback version of each book available. Now – with the help of the talented Joseph A. Batzel – I’ve also made them available as audiobooks. Joseph has done an excellent job of bringing Toby’s stories to life. At least, I think so. If you buy the audiobooks, I hope you’ll agree. Joseph Batzel has a BA and an MA from Brigham Young University in Film and Theater. He is also a professional actor for stage and film for over thirty years. Joseph has over 150 voice- over credits including radio, TV, audiobooks, and animation. He has traveled extensively throughout the US teaching voice over workshops. Joseph is a dialectician and can perform most American regional dialects and most foreign accents. Mr. Batzel has just joined Deyan audio one of the world’s largest Independent producer of Audiobooks as one of their narrators. He is married to his wife Alice of forty-four years, she is a published playwright and working on her first novel. They have two sons and five grandchildren. He presently lives in Brigham City, Utah where he currently works as an adjunct instructor at Utah State University teaching courses in Creative Arts and Public Speaking. 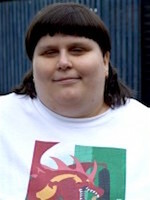 This entry was posted in books, creative writing, literature, newauthoronline, poetry, short stories, uncategorised and tagged acx, audible, blind children, blindness, children's stories, glaucoma, job access with speech, newauthoronline, Toby’s tales, victoria zigler on September 24, 2017 by K Morris Poet. As a small boy, I remember my grandfather telling me the below story, as to how the buds come to be sticky in springtime. I always assumed that he took the story from a collection of fairytales. However I have searched high and low and it would appear that he invented the tale to entertain me. However, if anyone does know the origin of the tale please do leave a comment. (I don’t remember the tale word for word so have used poetic license when retelling it). In order to catch the fairy queen. For I pardon your crime. Must paint the budds with your pots of glue. This entry was posted in books, creative writing, newauthoronline, poetry, short stories, uncategorised and tagged children's stories, fairytales, gnomes, k morris poet, nature, newauthoronline, poems, spring, springtime, the seasons on March 1, 2017 by K Morris Poet. Books are one delight that all children should be introduced to as early as possible in their lives. 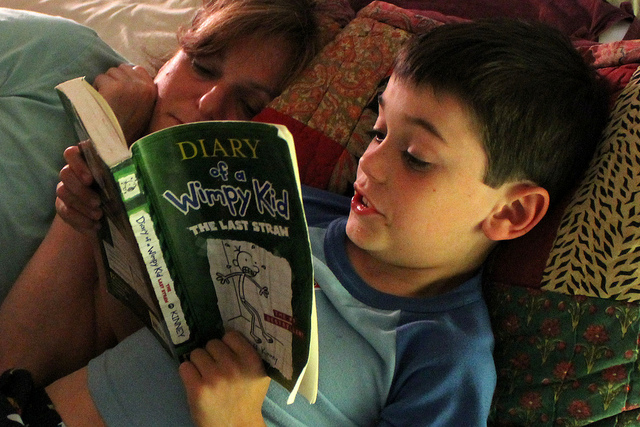 For a parent there is no feeling quite like the first time you read to your son or daughter. You are opening the door onto the huge world of literature. There is a book available for every type of reader, whether factual or fiction. Reading to your child will open their eyes to the world around them and the possibilities available to them; providing they are willing to let their imaginations run wild. Reading aloud to a child is possibly one of the most amazing gifts that can be given to anyone. It is actually the gift of time and of sharing this time together. Reading aloud to your child will create a lasting memory and a bond between you that will be incredibly difficult to break. 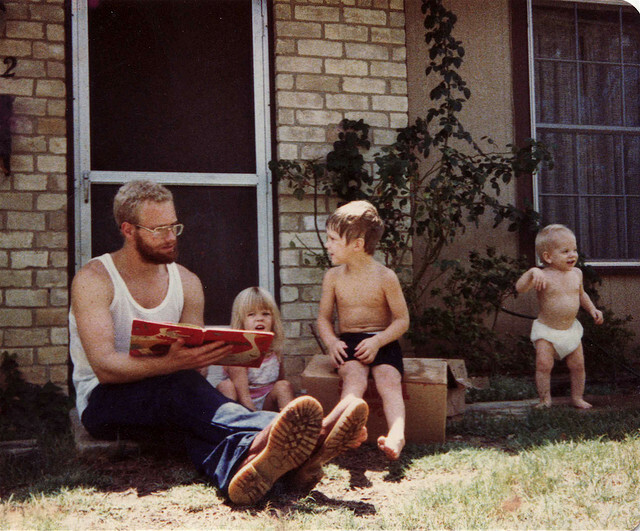 In fact, many adults describe being read to as a child as one of their most cherished memories. This gift allows your child to explore strange new worlds while wrapped in the security and safety of a parent’s arms. It is far more difficult in today’s modern age of electronics to obtain and sustain the attention of your child. Televisions are commonplace with a multitude of channels available to tempt anyone away from productive activities. Computers and the internet call out, desperate to tell you about the latest, incredibly important video release. Quite possibly this is concerning sleeping cats or hapless children. Society is gradually moving towards the completely electronic age and books will potentially become a forgotten form of media. This makes it even more important to read to your children for as long as you can hold their attention. If you do not make this attempt many children will never experience the joy of reading or the pleasure of time spent with a parent. Reading aloud allows you to portray the characters in a far superior way to simply reading the book. You are able to paint a picture and enthrall your children with the story. Their imaginations will know no limit as they immerse themselves into the story and become the hero, or even the villain of the piece. The storyline does not matter when it comes to your child learning from reading. They will listen to you, your pronunciation of the words and the meaning of them and learn this for themselves. Reading aloud to a child is one of the most effective ways to improve their language skills and broaden their vocabulary. Reading aloud to your child will also educate them in using their imagination and compiling these thoughts into a usable chain of events. Equally it will confirm to them that there is always time for reading. 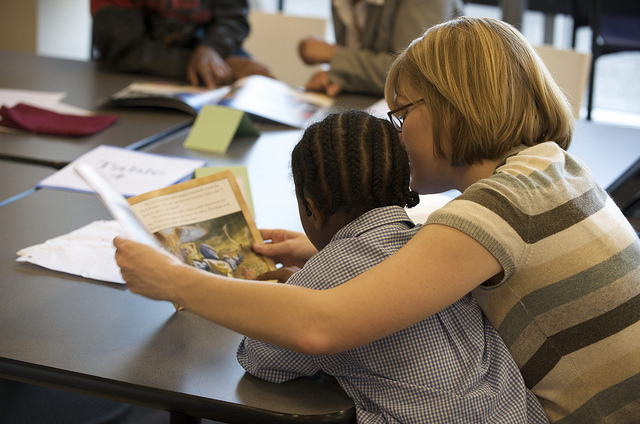 It can seem difficult to find time to read aloud to your child but it is not as difficult as you think. If you were to monitor the amount of times in one day you check your phone for an email, message or social media update you would quickly realize that you easily waster more than the twenty minutes of reading time recommended for children. By simply restructuring your day you may well gain more than twenty minutes. You will certainly gain a better relationship with your child. Research shows that children who are read to will grow up with a love of books and will want to learn to read, simply to pursue this love. Reading is an excellent way of learning and a vital skill – even if the majority of what you read is on the web. Taking the time to read to your child will ensure they want to learn this skill and they will be grateful for this as they grow older. As a parent, it should concern you that kids nowadays prefer tablets and Smartphone over books. Start reading to them from an early age, and you may instill a passion for reading. Do it periodically and make sure you read aloud; this way the story will become much more compelling. By Paul Trevino and LoveReading.co.uk! This entry was posted in books, literature, short stories, Uncategorized and tagged children's literature, children's stories, fiction, newauthoronline, reading, teen fiction, teens, young adult, young people on August 19, 2015 by The Story Reading Ape. not limited to – Apple, Barnes & Noble, and Kobo. I’m pleased to announce that I am finally able to grant these requests! following as soon as it can be arranged. though this will take a little longer to arrange. already available to buy in paperback. 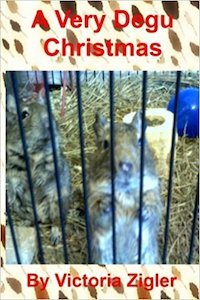 This entry was posted in books, literature, short stories, uncategorised and tagged a very degu christmas, animals, children's books, children's literature, children's stories, newauthoronline, pets, the great degu round-up, tori zigler author, victoria zigler author on June 7, 2015 by K Morris Poet.